Markus Dubischar thrives on exploring classicism in the modern world. He eagerly pulls volumes from his office bookcase that detail Greco-Roman architecture and iconography in early America, the antebellum period and into the 20th century. In an instant, he’s drawn toward an image of a 12-ton neoclassical marble statue of George Washington wearing a chest-baring toga perched atop a granite pedestal, searching for its inner meaning. It was originally installed in the Capitol rotunda after Congress commissioned it in 1832. Moreover, he says the Founding Fathers’ idea of the aristocratic, large-land-owner general who, after winning a war for his nation, releases the army and gives up his military might was also an important civic ideal of the Roman Republic, celebrated, for example, in the legendary patrician Cincinnatus. “George Washington and his contemporaries knew these stories well and modeled themselves and their young country after them,” Dubischar notes. In his quest to present classicism in contemporary contexts, the professor relentlessly pursues eternal themes with the muses, ancient philosophers, and Greco-Roman gods at his back. 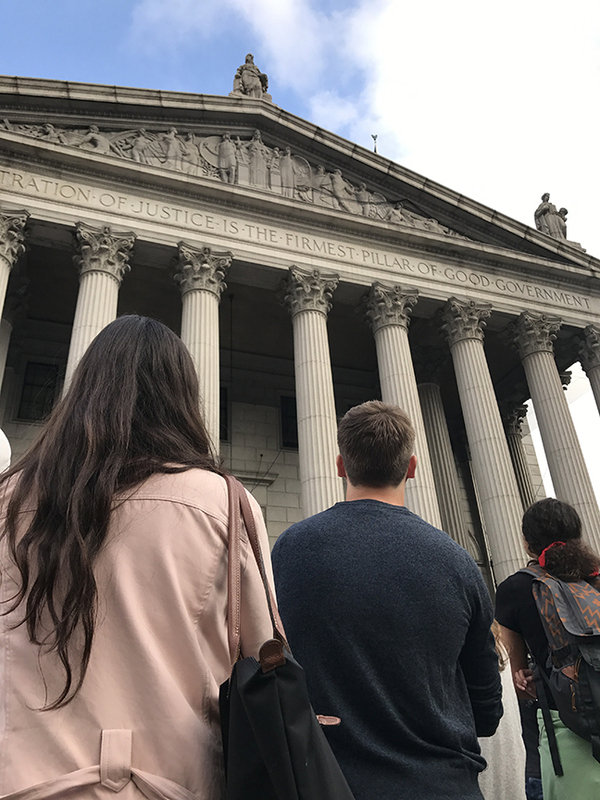 Not surprising, then, that Dubischar took his exploration and his students to the next level with an excursion to New York City this semester. The Big Apple drips with classical motifs, although most tourists and casual observers would easily miss them or fail to appreciate their significance. 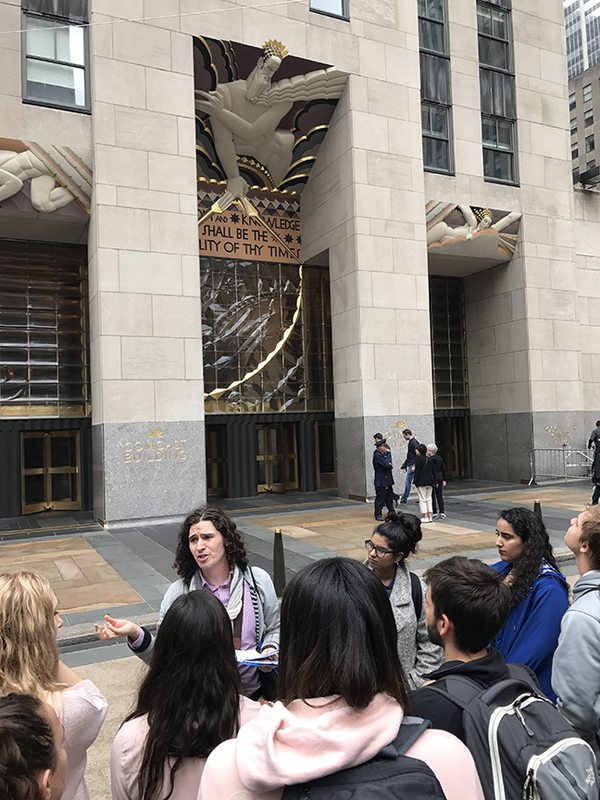 Rockefeller Center was among the stops where the group examined a cluster of mythologically themed architectural decorations and sculptures. Jared Simard, a postdoctoral fellow in classics at New York University who specializes in the reception of classical antiquity in New York City, particularly John D. Rockefeller Jr.’s deliberate use of ancient mythological motifs in public spaces, led the way. 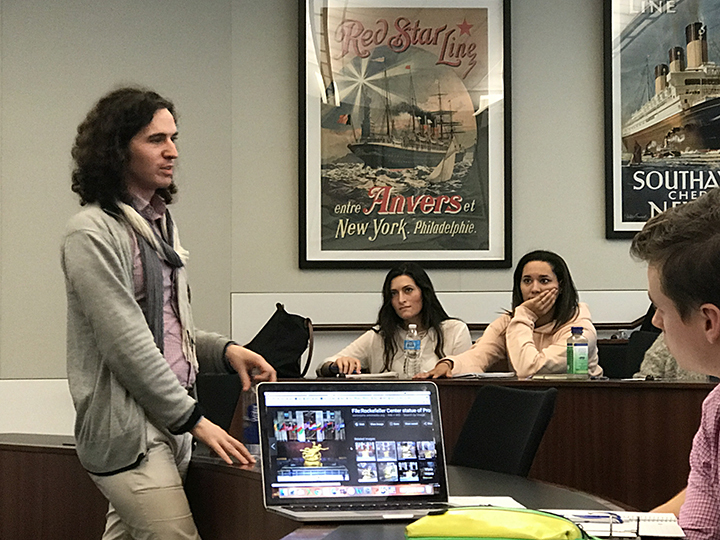 NYU fellow Jared Simard speaks to the class. Rockefeller Center represents a significant moment in time. It was built during the Great Depression, yet its grandiose scale transcends a dour time and points toward modernism. “Rockefeller Center combines breathtaking modern technology and architecture, but Rockefeller also wanted to connect it to humanistic ideals of classical antiquity,” Dubischar says. For Rockefeller, who oversaw the creation and placement of the artwork, the Greek and Roman imagery was not an academic exercise but a powerful statement about world peace. His students, too, experienced a classical awakening in a familiar place. “I was most surprised with the amount of thought and symbolism that went into these pieces,” Jamieson says. 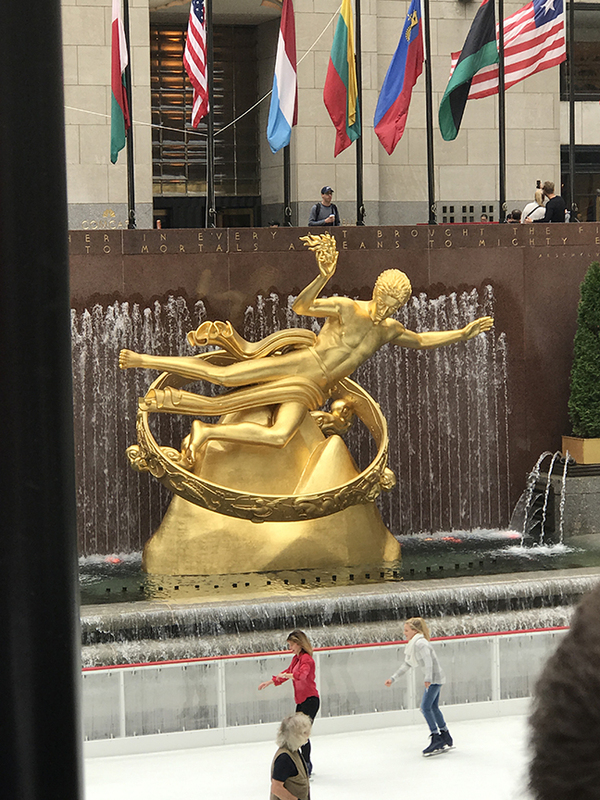 Tasnia Hassan ’18 was struck by the history of Rockefeller Center and the many mythological motifs depicting human nature and the progress of society.